Did you know that when you hit a certain milestone with your Google AdSense account, Google may show you an "achievement" card in your Google Adsense dashboard? Gabs posted a picture of something new he spotted in his AdSense console. He posted the picture at Cre8asite Forums, showing how when he broke 100,000,000 ad impressions over the life of his account, he received this acknowledgment from Google. Congratulations! 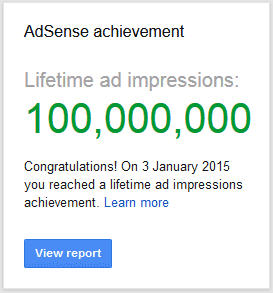 On 3 January 2015 you reached a lifetime ad impressions achievement. I've never seen this before but these are like virtual awards on top of the dollars Google pays publishers. You can learn more about these in the AdSense Help section.